​​Do Fleas Bite & Feed On Humans? Fleas are bloodsucking parasites that we generally associate with domestic and wild animals. 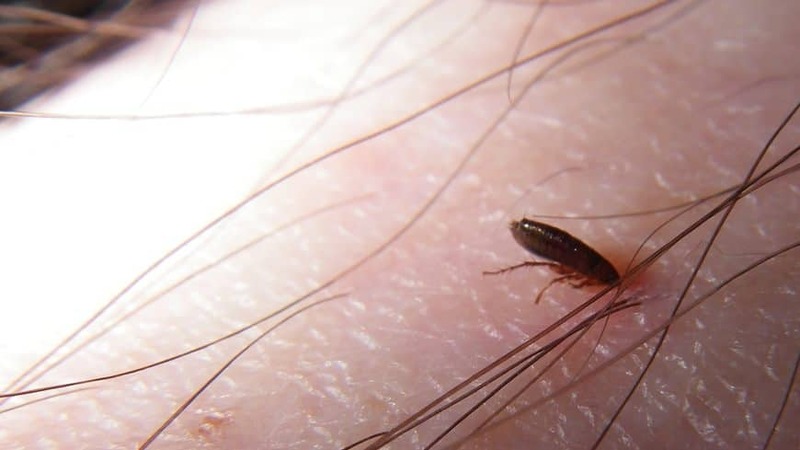 However, fleas bite humans more often than you might think. In this article, you will learn how to identify and prevent flea bites. I will also detail what diseases these small insects can transmit to humans through their bites. Can Flea Bites Spread Diseases to Humans? Fleas are parasitic insects that survive by feeding off the blood of their hosts. For a flea, a suitable host is any warm-blooded mammal or bird. As human beings fit into the mammalian category, fleas can and do bite us. There are an estimated 2,000 different species of fleas. Fleas have adapted remarkably well to living in a variety of climates. This means they can be found in almost all countries throughout the world. One of the identifying factors of a flea species is the type of primary host. This is a term that refers to a particular species’ choice of host. Certain species of fleas, such as the rabbit flea, are highly host-specific. However, most fleas are not discriminatory when it comes to their meals. Ctenocephalides felis is often referred to as the cat flea. Nonetheless, this opportunistic pest is found on a range of animals. Dogs, leopards, and even humans can fall victim to the cat flea. The so-called rat flea (xenopsylla cheopis) can also bite humans in the absence of their favorite host. Under the right circumstances, even bird-specific fleas can bite humans. There is also a species of flea nicknamed the “human flea,” which is pulex irritans. Similar to the cat flea, this moniker is misleading. Pulex irritans feeds off a variety of mammals. Captive monkeys, dogs, cats, rats and many other animals can all host this species of flea. Fleas are external parasites. Exempting the sand flea, adult fleas will feed on the surface of the skin rather than burrowing inside it. Fleas are designed to be efficient yet, powerful bloodsuckers. They eat through a tube called the epipharynx. This pipe is surrounded by sharp mouthparts that allow them to slice through the host’s skin with ease. These saw-like devices are known as laciniae. Aside from cutting through skin, the laciniae work to channel saliva into the bite. Flea saliva plays a key role in the feeding process as it contains anticoagulants. These are compounds that stop blood from clotting. Flea saliva is also the reason why flea bites are so itchy. Once the flea’s epipharynx is set firmly into your skin, it will begin feeding. Powerful suction pumps, located inside the mouth and gut of the flea, help to pull blood through the epipharynx. It will take up to half an hour for a flea bite to show up on your skin. Even if you don’t see the bite immediately, you will feel it. Flea bites can be incredibly itchy. A flea bite manifests as a small, red bump. You will likely notice a cluster of randomly-placed bites around the site of which blood was taken during feeding. These little bumps may eventually develop into a small wound or a blister. Sensitive individuals and children may have a more extreme reaction to flea bites. This is particularly common if the person is bitten repeatedly. Dermatitis is one manifestation of sensitivity to flea bites. This can appear as a rash on the skin surrounding the bite. In severe cases, the rash can spread to other areas of the body. Redness, swelling, and itching can be alleviated within a few days with medication. Occasionally, marks from the flea bites can remain on your skin for longer. Fleas can bite you anywhere on your body. However, bites on humans are most commonly reported to be found around the ankles and feet. Fleas can carry a variety of harmful contagions and parasites. These can be easily passed on to a flea’s host through their bites. Historically speaking, fleas are one of the most significant disease carriers. The most notorious case of flea-transmitted pathogens was the bubonic plague. One of the most lethal diseases known to mankind, it killed millions in Europe during the Middle Ages. This disorder is characterized by general malaise and swollen lymph nodes. Fleas carrying plague bacteria would feed off rats, thus infecting them. The rats would inevitably die of the illness but their fleas would survive. As their rodent hosts died off, the fleas began targeting humans. The human hosts would then become infected from flea bites. There are several species of flea that still carry the plague today. These include the rat flea, the human flea (pulex irritans), and a few others. Thankfully, if the affliction is caught early enough, it can be cured with a course of antibiotics. Unfortunately, plague is not the only disease fleas can carry. Flea bites on humans can also result in murine typhus. As fleas eat, they defecate on the host’s skin. You can catch murine typhus when an infected flea leaves its feces behind and they enter your skin. This can happen by scratching flea bites or through any open wound or scratch. Although this is an extreme example, it illustrates why you should not scratch flea bites. Scratching the bites heightens your risk of a secondary infection. The symptoms of murine typhus include nausea, vomiting, fever, and chills. Other signs include stomach pain, aching muscles, coughing and a rash. Cat flea typhus or flea-spotted fever is another flea-borne illness. This disease manifests as a scabby rash, fever, headache, and fatigue. The prevalence of diseases transmitted by fleas and other insects has increased in the United States. Diseases caused by flea bites are a leading cause of sickness and even death across the globe. If you have been bitten by fleas, it is always recommended to consult your doctor. If you develop any unusual symptoms after being bitten (e.g. fever, blisters, etc), seek medical attention immediately. To prevent flea bites, identify and confront your personal risk factors. For example, if you have a flea-infested pet, you have a high risk of being bitten. Although adult fleas stay attached to your pet, their eggs do not. Instead, they drop off into the surrounding environment. During the early stages of a flea’s life, it does not need a host to survive. After hatching, the flea larvae will eventually form a cocoon. Freshly-emerging adult fleas need to feed within a few days or risk death. If your pet is not in the vicinity, the flea will bite you instead. Similarly, if you treat your pet for fleas but neglect to treat your home, you are still at risk of flea bites. Remaining fleas repelled by pet medications will seek a new host - possibly you or one of your family members. Always check with a veterinarian before starting a flea treatment for your pet. Flea medications can be toxic if misused, so follow guidelines explicitly. Getting rid of fleas in your home involves a multi-strategy approach. Vacuum your floors, furniture and carpets thoroughly. This is to eliminate as many eggs, larvae and cocoons as possible. Wash all bedding in hot, soapy water. Choose an insecticide that is appropriate for your household (e.g. child-safe) and use it as directed. Flea spray can also be used on carpets and furniture to control populations within the home. Certain areas outdoors can be endemic for fleas, including your yard. Long grass and thick vegetation make ideal breeding grounds for these parasites. Yard flea sprays can also be purchased to control outside infestations. Keep the yard neat and treat it regularly with insecticides to kill and repel fleas. You should be especially vigilant during the summer months when fleas are more active. Wild animals entering your yard or home can also initiate flea infestations. Ensure wild animals cannot nest in vulnerable areas on your property. Make sure your attic and roof are thoroughly sealed. Build barriers to protect spaces underneath your home, porch or deck. Another significant risk for flea bites is spending a lot of time outdoors. Fleas are skilled jumpers and can attach to your shoes or the legs of your pants. Use an insect repellant specifically targeted for fleas when outside. Do not interact with stray or wild animals, as they can harbor fleas. On the same note, do not allow your dog to get near these animals during walks. Certain regions have known populations of disease-carrying fleas. Western states, such as California and Arizona, have rodent populations with plague spread by fleas. If you are living in such an area, take appropriate precautions. Avoid frequenting rodent habitats, e.g. a field with a colony of prairie dogs. Any children in your home should also be aware of safety tips to avoid flea bites. Have your doctor recommend an appropriate insect repellent to protect your child outdoors. Fleas biting humans can have serious consequences. Prevention is always the best strategy when it comes to flea infestations. Take necessary precautions to keep you, your children and your companion animals flea-free. Maintaining your yard and your house is also critical when it comes to avoiding flea infestations. It is always best to seek professional medical advice for flea bites on both humans as well as pets.